Suzuki has officially revealed the next generation WagonR range for the Japanese domestic market. Specifically designed to meet Japanese ‘Kei’ segment specs, Suzuki has revealed the all-new WagonR and the Stingray models in Japan. The design of the vehicle is all new and it gets boxier than ever before, for which it now resembles a van. The JDM spec WagonR will also get Suzuki’s Smart Hybrid Vehicle System technology. In terms of styling, the new standard Suzuki WagonR gets an all-new grille, with squared headlamps, an all-new front bumper and a shortened bonnet. The Stingray, though based on the exact same car, is significantly different in terms of design. The bonnet is extended further to the front of the car with a two-part grille and angular headlamps with a sportier front bumper and vertical fog lamp housing. The side of the cars are quite plain, however, the B-Pillar design that is thicker at the bottom adds a bit of wackiness to it for some flair. To emphasise the wheel arches, a bold line runs along the flat panel to give it break up the flat sides panels. The rear of the WagonR is plain, flat and boring with a large rear windscreen and the flat boot lid featuring nothing but a handle and the badges. At the bottom are two horizontal tail lamps placed low down above the rear bumper. The interior cabin is completely new with a centrally mounted instrument cluster with a touchscreen infotainment system. The large gear lever for the automatic gearbox in the centre placed on the base of the console rather than the floor. The standard car has a black and beige dual-tone interior however the Stingray version will get an all-black cabin with red inserts and highlights. The new WagonR range will get a base trim with a 660cc, three-cylinder petrol engine that develops 51bhp and 60 Nm of torque. The mid and top of the line trims get the SHVS system which adds an additional 3.1bhp and 50Nm of torque. However, the Stingray is slightly more powerful as the engine is tuned to produce 65bhp and 98Nm of torque. The engine is mated to a continuously variable automatic transmission with an option of front or all-wheel drive. This new generation WagonR and Stingray are designed specifically for the JDM market. 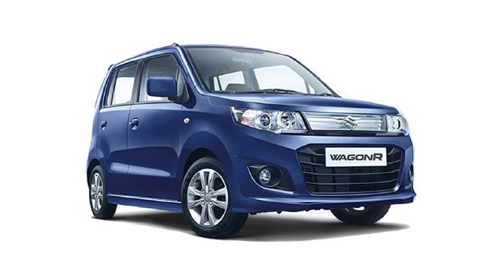 in addition to the update, Maruti Suzuki has given the current generation WagonR in India, it seems highly unlikely for it to arrive in India anytime soon, or at all. But rumours claim that the next generation WagonR for the Indian market is expected to be in the works based on the underpinnings of the new Ignis.